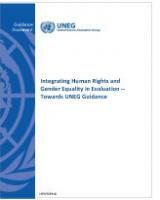 The purpose of this book is to provide guidance on how to integrate gender equality issues into national evaluation policies and systems (NEPSs) that are being implemented in an increasing number of developing countries around the world, with the aim of making them gender-responsive. 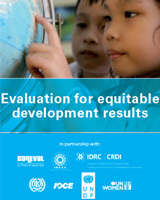 The document is intended for all of the different public and private-sector agencies involved in the design, implementation and use of evaluations of development policies and programmes as well as organizations concerned about ensuring that evaluations address issues such as gender equality, social equity and human rights. 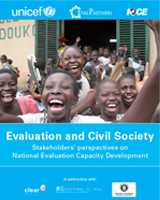 This is the second book in the series on Evaluation and Civil Society. This book is focused on case studies highlighting the experiences of regional and national VOPEs. They share their experiences in strengthening the capacities of individual evaluators to produce credible and useful evaluations, the institutional capacities of the VOPEs themselves, promoting equity-focused and gender-responsive evaluations, and, especially, the roles VOPEs are playing to improve the enabling environment for evaluation in their countries. 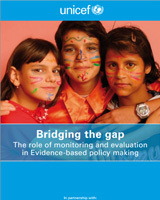 We hope this book and others in the series will contribute to the capacity of the evaluation community to strengthen the use of evaluation to enhance evidence-based policy-making, transparency and learning as well as the relevance and quality of evaluations so as to better inform equitable interventions. We wish you an interesting and inspiring read. 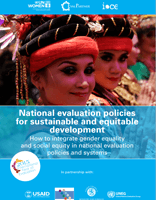 This publication aims to contribute to the international debate on how the evaluation function can contribute to achieving equitable development results by conceptualizing, designing, implementing and using evaluations focused on human rights and equity. It does so by offering a number of strong contributions from senior officers in institutions dealing with international development and evaluation. These are: UNICEF, UNDP, UNWomen, ILO, IDRC, the International Development Evaluation Association (IDEAS) and the International Organisation for Cooperation in Evaluation (IOCE); as well as senior Government representatives responsible for evaluation systems in their country, such as CONEVAL in Mexico. The manual starts by defining equity, why equity matters and why equity is so urgent now. It then explains what an Equity-focused evaluation is, explaining what its purpose should be and potential challenges in its promotion and implementation. 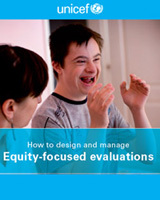 The second part of the manual explains how to manage Equity-focused evaluations, presenting the key issues to take into account when preparing for the Equity-focused evaluations and developing the Terms of Reference, including presenting potential equity-focused evaluation questions; how to design the evaluation, including identifying the appropriate evaluation framework, evaluation design and appropriate methods to collect data; and how to ensure the evaluation is used. The document also addresses how to conduct Equity-focused evaluations under real-world constraints. Last but not least, eight case studies are included to illustrate how evaluations supported by UNICEF have addressed equity-focused issues. Within the international community, there is a growing recognition that national capacity development for monitoring and evaluation systems is an essential part of the broader support to policy reform and to promoting national ownership of evidence-based policy making. 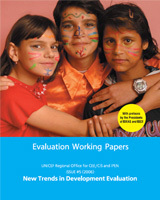 With the aim of sharing good practices and lessons learned on this strategic issue, UNICEF and IOCE (International Organization for Cooperation in Evaluation), in partnership with UNDP, WFP, UNIFEM, ILO, World Bank and IDEAS (International Development Evaluation Association) published this book. 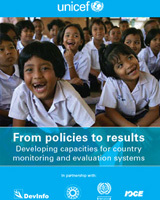 This publication offers a number of strong contributions from senior officers in institutions dealing with national monitoring and evaluation capacity development, as well as senior Government representatives responsible for the national monitoring and evaluation systems in countries in Asia, Africa and Latin America. 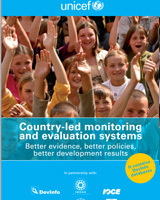 This publication, produced by UNICEF in partnership with the World Bank, UN Economic Commission for Europe, IDEAS (International Development Evaluation Association), IOCE (International Organization for Cooperation in Evaluation), DevInfo and MICS, brings together the vision, lessons learned and good practices from different stakeholders on how country-led monitoring and evaluation systems can enhance evidence-based policy making. 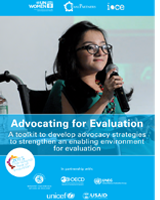 The Evaluation Working Papers (EWP) are documents that present strategic evaluation findings, lessons learned and innovative approaches and methodologies. We would like to encourage you to propose relevant papers that could be published in the next EWP issues. 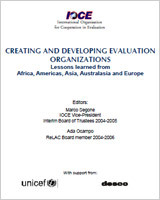 This publication brings together 14 cases studies on creating and developing evaluation organization in different regions and countries. It presents good practices and lessons learned on how to strengthen the institutional capacity of evaluation organization, as well as what’s the role of international organizations should be in national evaluation capacity development. This publication aims to contribute to the international discussions on how different stakeholders can create synergies and partnerships to contribute to equity-focused and gender-responsive country-led evaluation systems. 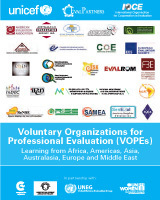 This book highlights in particular the strategic roles of Civil Society Organizations, notably the Voluntary Organizations for Professional Evaluation (VOPEs), are playing to promote the use of evaluation to enhance evidence-based policy-making, transparency and learning; and the role of EvalPartners, the new International Evaluation Initiative to strengthen Civil Society’s evaluation capacities through collaborative partnerships. This book makes a significant contribution to these discussions by offering a number of strong contributions from senior leaders of institutions dealing with international development and evaluation. These are: UNEG, UNICEF and UN Women from the United Nations; the Independent Evaluation Group and the CLEAR centres from the World Bank; OECD/DAC Network on Development Evaluation and the Government of Finland from the bilaterals; and the International Organization for Cooperation in Evaluation (IOCE) representing the global community of VOPEs. The international community agrees that monitoring and evaluation has a strategic role to play in informing policy making processes. With the aim of improving relevance, efficiency and effectiveness of policy reforms, UNICEF, in partnership with DevInfo, IDEAS (International Development Evaluation Association), MICS and The World Bank published this book. This publication offers a number of strong contributions from senior officers in institutions dealing with Evidence-based policy making.